‘The Carmichael Show’ creator and star Jerrod Carmichael explains why he only pitched the series to NBC, and why ending up on the network is the realization of a lifelong dream. 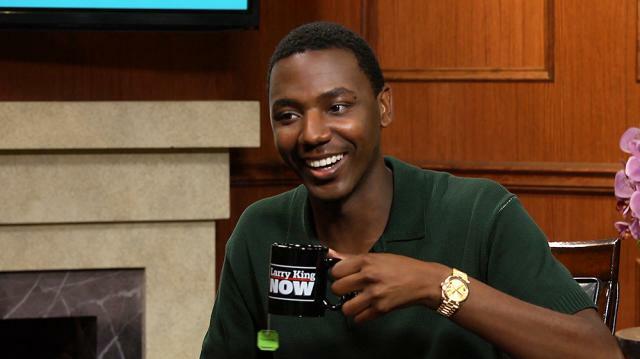 Jerrod Carmichael: I think it’s figuring out its comedy brand. You know, NBC is in a place of redevelopment, which is kind of why I was attracted to NBC in the first place. I only pitched to NBC, because I was only going to sell it to NBC. Jerrod Carmichael: Because I was only making a show for NBC. Larry King: Wow. Usually you pitch to ten people? Jerrod Carmichael: Yeah, yeah and I did...you know… I did a deal with Universal because I was like, “Yeah, they can’t pitch to other places.” But I knew, NBC would be first and that’s the only place I was gonna do a show. That was it. Larry King: I understand this show is a realization of a life-long dream of yours? Larry King: Starting at what age? Jerrod Carmichael: I think I was like 11 or 12. I used to tell me brother and my family that I wanted a show on NBC because a lotof my favorite shows were on there, everything from -I watched television with my parents: ‘Cheers’, ‘The Cosby Show’.You’d watch, you know, ‘A Different World’, and you’d watch ‘Seinfeld’, and you’d watch all of these things. I was like: “I wanted to be on that, ‘Fresh Prince’ is on that!” You know? And that was kind of the goal. I wanted Thursday nights at eight, but, you know, Wednesday’s at nine is fine. You know, we can’t have it all Larry!